Program Design is hard work. I’ve spent years experimenting and testing the latest techniques and research to learn the true methods to achieving incredible fitness and fast results. When you join me in Online Personal Training, I will take all those years of knowledge and devise the perfect program for you…so let’s look at that now. Fitness programs are like peoples waistlines, they change over time. Doing what worked a month ago for you won’t work now. The reason is because your body develops. It becomes stronger and leaner, harder, and firmer, faster and more flexible. And just like your advancing fitness levels, your program must advance as well. Click on the image to open a larger image of the training program. Don’t worry it will open in new window so you don’t lose your place here. To the left of this you will see the actual instructions telling you how to do each exercise. These are highly detailed, so even you are never lost on an exercise. Finally I have the number of repetitions I want you to do, (the number of times you repeat a lift) and the number of sets I want you to do (how many times you do the reps). So for instance if you had 4-6 reps and 2 sets you would repeat the movement 4-6 times rest for thirty seconds and do it again for another 4-6 reps.
That’s it – Just print off your program and away you go. But how do you access these amazing programs? Good question…well when I do your program design design I also build you your own personal fitness website. You get your own personal login and password and you have access to a whole load of excellent features. The first thing you see is a calendar telling you when your workouts are. 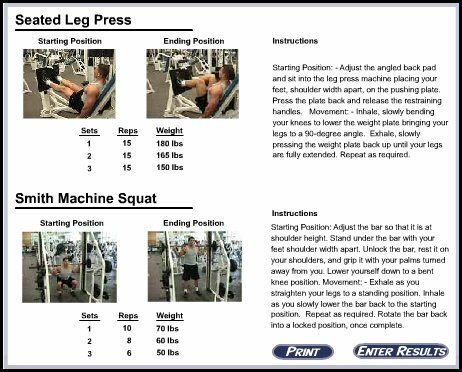 You can simply click on any of those to see and print your workouts. Now that you understand Program Design and why it's so important for your results I’d like to show you how to Leave Feedback for Your Trainer – me! Got Program Design down? Then check out Fantastic feedback.